"I send all my support to the Japanese people. Since the earthquake, they are always in my thoughts, especially the triathletes. I hope that they and their families are all fine. I'm sure you will not give up and will be strong to overcome this big problem. I'm with you guys, all the triathletes around the world are with you...will see you soon on the races. I wish you all the best." "I loved Kamaishi, one of the best events I did in the World. The people were incredible! Kamaishi and indeed Japan was very good to me. I had been wandering if my friends were still alive. To see the pictures of the sea front now and the owner of the hotel I stayed in amongst the rubble is shocking. But at the same time it is a relief to see they are still alive." "I look forward to being able to contribute funds to help you in your goals to mobilise the triathlon community to support the people of Kamaishi. Having raced in Japan as an elite athlete myself (see picture), now working as an academic and civil engineer in advancing mitigation of natural hazards, I am committed to improving quality of life for those threatened by or exposed to natural disasters. Thank you for taking this excellent initiative and doing all the hard work to make it deliver." "Being a Yorkshireman I like to know where my money is going! I would hate to think that half of it was being diluted into wages and flights for gap year students! 100% of the money raised by tri for Japan is going to be used to help rebuild the great Triathlon town of Kamaishi, which has been devastated by the tsunami. I look forward to Mike and Rieko letting us all know what our money has helped to provide." "You always feel really useless in these situations, as often there is very little you can do to make a real impact. Knowing Mike and Rieko, they will put to use every penny raised to try and restore the poor people of Kamaishi's lives." "Japan is so special to me - I won my very first ITU World Cup there, back in 2005 in the town of Ishigaki. I've loved my visits to Japan. It is and always will be such an amazing country - but the Japanese people really need our help at the moment. Japan and it's people are hurting, and it's going to take the worlds combined effort to ease that pain. We as human beings just can't stand by and wait for someone else to step in - the time is now for us to stand beside our fellow triathletes and show our support for them." "I have been watching all the developments on the news in Japan and its heartbreaking to see the devastation . I have always loved going to Japan to race, as the love the Japanese people have for triathlon makes the races fantastic and we have a warm welcome. My thoughts are with all the Japanese people and triathletes, I hope they have the strength to get through these tough times." "I have raced and trained in Japan many times in my Triathlon career, most recently with Emma Davis of Ireland before she competed in the Beijing Olympic Games. The Japanese people are so welcoming and helpful that it is devastating to think what they are going through at the moment. 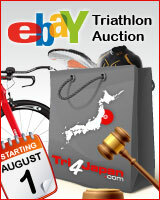 I will do all I can to help with Tri4Japan." "In all my years racing and working in Japan, the people have never ceased to impress me. I have been touched deeply by their kindness and generosity. Now is the time for us to step up to the plate and demonstrate our own human qualities. Mike and Rieko Trees of tri4japan epitomise the spirit of social responsibility and action. In the context the natural and human disaster in Japan, they are in a position to provide swift and valuable support." "Coming back from my training base where I have no television or internet last week to see the reports of the horrendous situation in Japan I was completely stunned, in fact every day when I watch more news coming in I still am. It is utterly unbelievable for one country to have been hit by so many problems. 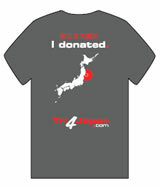 I am behind tri4japan whole heartedly and will be doing everything I can to help push the cause. I have many good memories of my pre-Olympic training camp in Matsue. Everyone from the town was so welcoming and helpful, it saddens me now to think of what they are going through. I will be heading back to Japan in 3 weeks to take part in the Ishigaki World Cup which I have been told is to go ahead. The fact that the triathlon will be run is a great demonstration of the work ethic and determination of the Japanese people." "I just wanted to drop a line of support and encouragement to everyone in Japan. To see the devastation that has taken place is just heartbreaking. Japan has been one of my favourite countries to race in around the world; whenever I was there I was always overwhelmed by people's generosity, loving and kind nature. In such a tough time I too hope that people get together to help in any way that they can." "Just want you guys to know I am thinking of you all and have so many memories of racing all over japan. Japan is where many of us made our first trip overseas to race and for me was my first podium at a world cup. Japan has always offered us athletes a great time too in Japan, experiencing the culture, meeting the families, and some amazing post-race events. I hope to help you guys support these people now and give back to them through my racing, which Japan, its race directors, fans and families helped me create. Cheers, from the biggest guy to race in japan, the Green Giant!" "Japan holds very special memories for me as an athlete. It was here in 2008 that I won my first ever Xterra Global tour event held in the province in Maranuma. What struck me that trip was the amazing hospitality and generosity of the Japanese people. We have made many great Japanese friends during our visits to the country and were honoured to be invited to be invited to Hiro's wedding in Maui last year. Many of my sporting battles have been with great Japanese rivals such as Taro Shirtao and Takahiro Ogasawara and no matter who wins we always have great respect for each other, after one race Oga'san gave Susan my wife a piece of handmade jewellery which she loves and wears to all races. Right now the people of Japan need our help, so let's help rebuild their country, as i know they'd help us if we were in need." "I, unlike many giving testimonials on here, have never been to Japan, however I have heard only good things about the island nation that gives the world so much, whether that be Japan's history, biodiversity, culture or economy. It's warm and friendly people that I've met on my travels are ingrained in my memory for good. One of the most colourful and genuine characters that I've met in my sporting career is a resident of Tokyo and thankfully he and his family are safe and well, however many aren't so lucky. These people are just like you and me, so support this fantastic initiative as much as you can." "Having towns like Kamaishi, as a location destination for athletic events, is what makes a community special. They deserve a hand-up. It is my dream that with our help, Mike and Rieko will renew the spirit of the people who live there. To ease the burden of suffering, to reach out with generosity and kindness, and to help others in a time of need, is a monumental goal in life. I'm proud to be part of it. 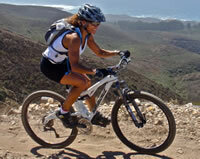 My endurance-athletic foundation started with triathlon many, many years ago. From there, I was fortunate enough to move on to a career as a professional cross-country mountain bike racer, and television personality for adventure sports. It has always been the places I traveled and the people I met that made these memories lasting and ultimately shaped who I am. Japan, has touched me in an equally profound way."